Austin-based designer Sharon Binns showcases a variety of one-of-a-kind children's clothing at SparklePanda Design. All of her offerings are made using repurposed vintage and modern fabrics resulting in adorable retro-inspired clothing. 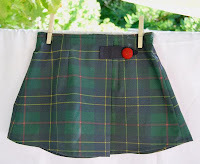 All little girls look cute in plaid skirts & Sharon currently offers two in green (pictured) and blue. Another lovely skirt is the multi-colored stripwork skirt made from four vintage pillowcases. And perfect for warm weather days are the various sundresses and wide-leg pants. And don't miss out on the darling yellow & black Baby Ruffle Pants.